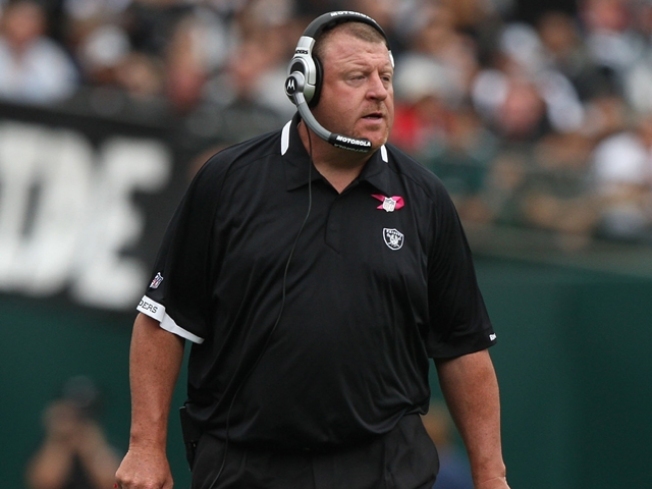 Head coach Tom Cable of the Oakland Raiders is being forced to see a shrink. It's never a bye week when it comes to strange news out of Oakland Raiders' headquarters. As the Raiders enjoyed their week off Sunday, the news broke on ProFootballTalk.com that their coach would be required to undergo the unusual process of a league-mandated psychological evaluation. Tom Cable will be asked to undergo an NFL doctor's and a psychiatrist's evaluation to assess possible substance abuse or anger management issues, ESPN's Chris Mortenson reported. The request for a psychiatric evaluation comes in light of recent allegations that Cable assaulted assistant Randy Hanson and physically abused two women in the past. Plenty of NFL coaches seem insane, and it's not like Tom Cable is one of those guys who goes around blithering "They are who we thought they were!" He's actually got one of the more composed public demeanors of any NFL coach. But two is a trend and three is a pattern, and this guy has three assault allegations against him. So he's kind of in Pac-Man Jones territory there, whether he deserves to be or not. It's yet another way in which Tom Cable's situation has become somehow even more tenuous after he evaded criminal charges. Joe Kukura is a freelance writer who thinks Tom Cable should have undergone a psychological evaluation after attempting a fake field goal on 4th and 10 in a 3-3 game.